It all started with Date Night. My wife and I received advice long ago that Date Night was the key to a successful marriage. We had plans, but a friend came by and asked if we wanted to go to an art show instead. That was the night I was introduced to Tempt. Since that night, my life has never really been the same. 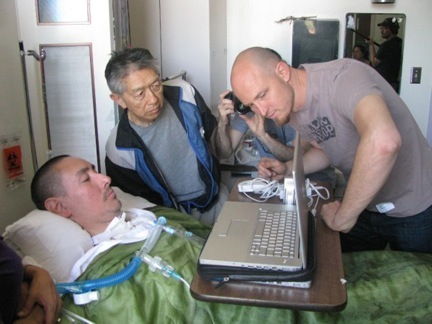 The EyeWriter has been a journey, and due to the nature of ALS it’s a never-ending one. It started in 2008, and it continues on today. I am often asked, “Why did you do it?” The first time I heard this question, I was caught off guard. I had never really thought about “why” I did it. I was always just focused on the “how” to get it done. We weren’t trying to create the next big thing. We didn’t have visions of revolutionizing the medical device industry. We wanted to help Tempt. One person. I think that had we gone in with visions of sugarplums and tried to help all people with ALS, we would have missed the mark of creating something that helped Tempt because we would have been so distracted. Singularity of focus kept us and keeps us on track. After our documentary premiered in Park City, a group of computer programmers approached us to tell us how much they enjoyed the film. They told us that since seeing our film they had been discussing amongst themselves why they thought we had succeeded. Their consensus? “If you had any f***ing idea how hard it was to do what you did, there was no way you would have done it in the first place.” They had discussed this idea amongst themselves and concluded that they should become more like us. “Clueless?” I asked. “Sort of… more like naive,” they replied. Turns out, our naivety was the key to us tackling the EyeWriter with brave abandon. We didn’t know that we weren’t supposed to be able to do it. We didn’t know that kind of thing doesn’t really happen in 2.5 weeks. We didn’t know what we didn’t know. And because of that, the entire team just did it because no one ever contemplated or considered the concept of failure. 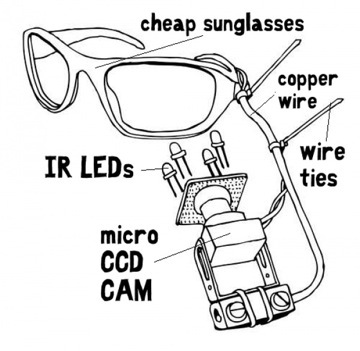 Since this project has been ongoing since 2008, I’ve had some time to think about the “why.” Why I pushed so hard to make the EyeWriter for a person I didn’t really know at first. Why it was so successful. Why it seems to touch people in such a powerful and meaningful way. I did it for my brother. I did it for my dad. I did it for my sons. It’s really that simple. The day I met with Stephen and Ron, Tempt’s brother and father, it was like looking in a mirror that somehow, luckily, had avoided me. I am a father. I have sons. I have a brother. I could not imagine what it would be like to not be able to talk to them everyday and ask them what they were thinking or feeling. Basic communication was nearly impossible for Tempt. That struck me as wrong. Why did I do it? Because I don’t think anyone who has stared face to face with a reality like that can just walk away and say, “Good luck. I hope everything works out for you.” You can’t walk away from someone or something that hits that close to home. I had no idea how it was going to affect my life — or more importantly — how I was going to pull it off. But I knew I could not, in good conscience, just walk away.